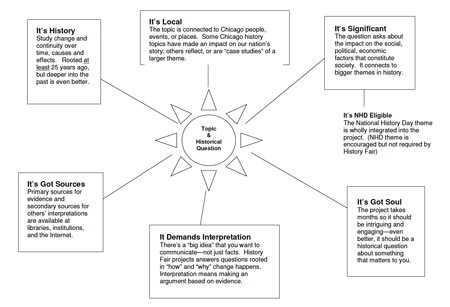 The graphic above from the Chicago Metro History Education Center (CMHEC) is a great encapsulation of how to choose a topic for a history fair project. In addition, ask yourself the questions listed below. 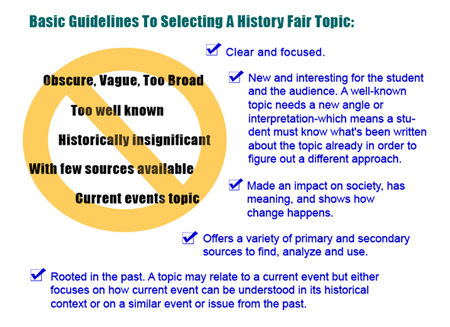 Below we dig a bit deeper and uncover some strategies from TPS-Barat and CMHEC for selecting a topic for your history fair project. Each year NHD chooses a particular theme that must be the focus of student projects. For 2015, the theme is Leadership and Legacy in History. Before doing anything else, make sure you understand the theme. Read the article National History Day 2015 Theme: Leadership and Legacy in History. Read a student’s perspective of Important Elements of Leadership and Legacy. A few more suggestions adapted from suggestions from a NHD coordinator from an article found on the CMHEC website are listed below. Discuss how the theme of Leadership & Legacy relates to people, events, and issues you’ve learned about earlier this year and in previous years and make a list. Remember, the theme is leadership and legacy; you need to address both in whatever topic you choose. Review the CMHEC suggested topic ideas and associated Library resource lists compiled by TPS-Barat. Consider refining your topic using the following steps: theme, interest, broad topic, narrow topic, thesis. Visit the the NHD Getting Started page for a detailed explanation and examples. Try filling out one of these topic selection worksheets from CMHEC.